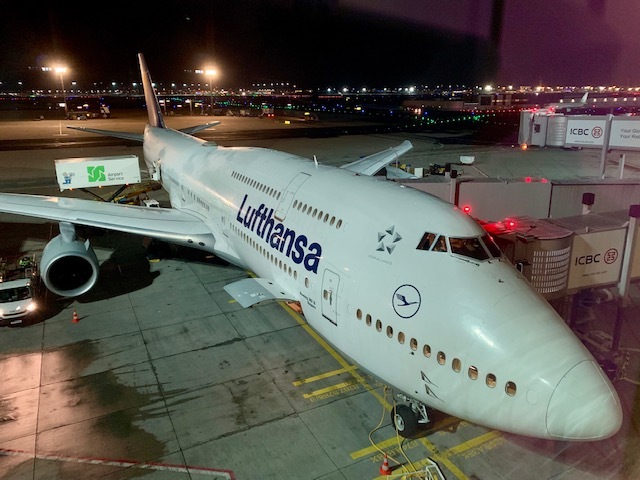 Lufthansa B747-800 long haul business class review – how does it compare to BA? 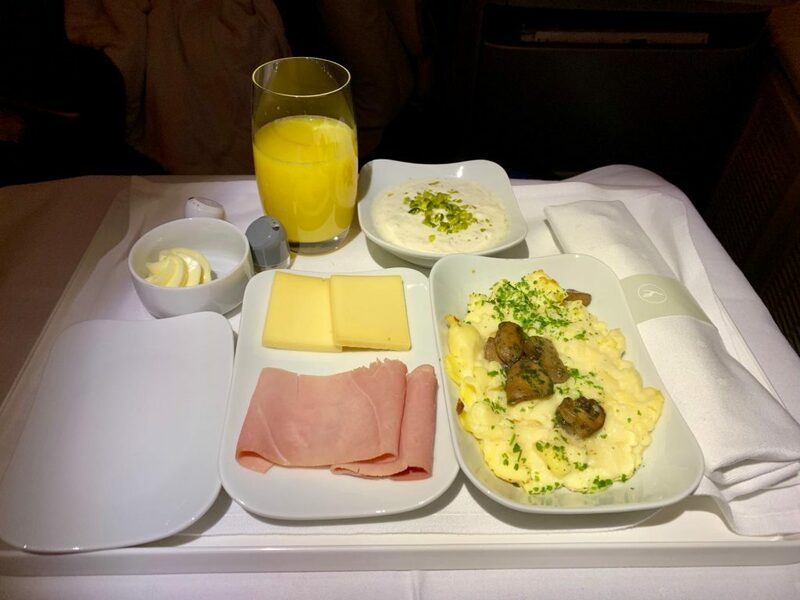 This article is a continuation of the review of my flight between London and Frankfurt that you can read here. 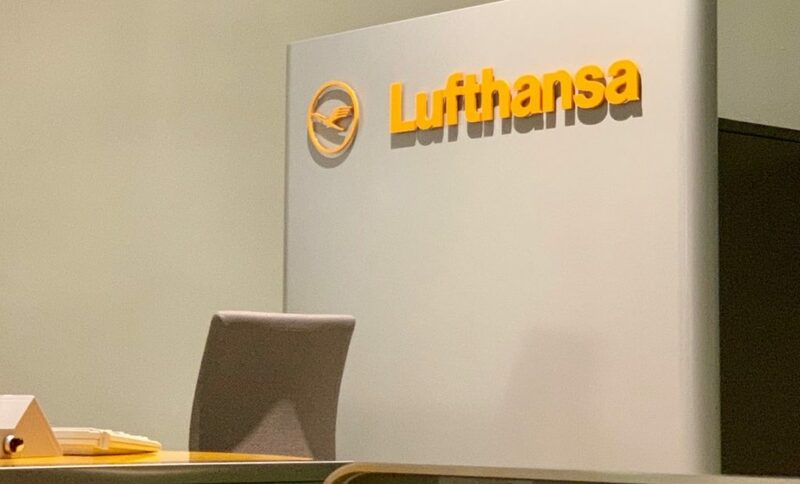 In this article, I will talk about the Frankfurt lounge and the flight between Frankfurt and São Paulo on the B747-800 from Lufthansa. 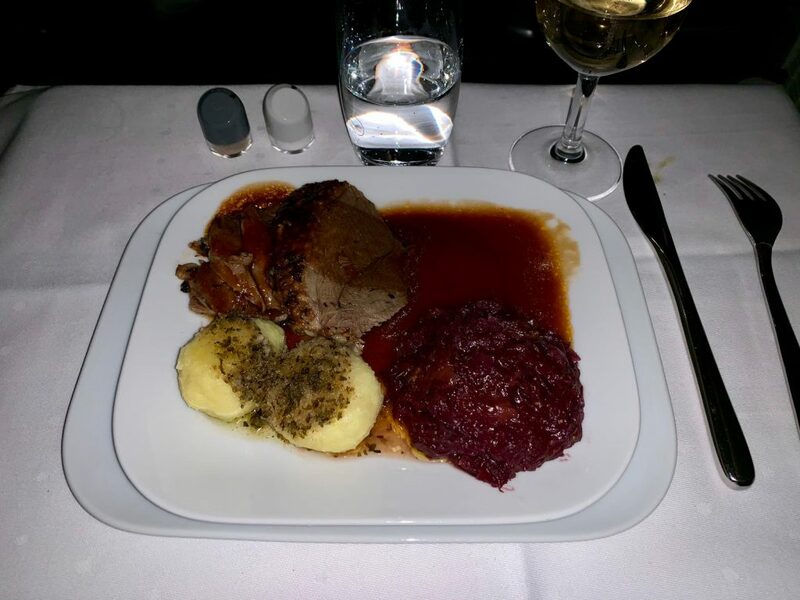 Let’s check out what’s good about Lufthansa’s business class! Frankfurt Airport is not the most user-friendly airport. That’s a fact unless you’re travelling first class which has its own terminal, of course! 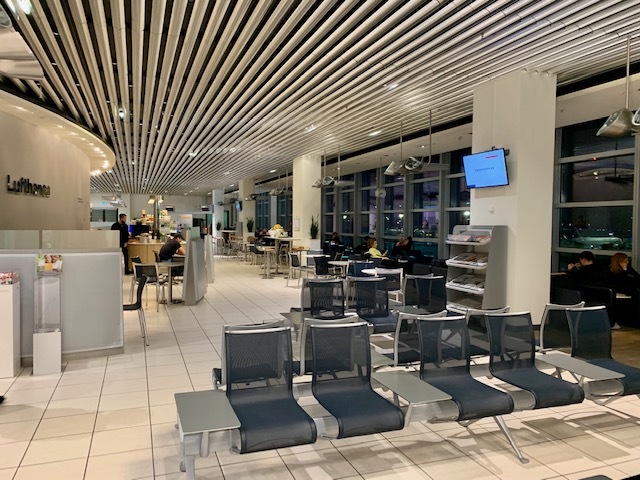 As I was coming from London, which is out of the European Union passport control area (Schengen) and on to São Paulo, my easy-access lounge options were quite limited. I could go through passport control, go to the main terminal and then (after passport control again) back to Pier C. But I was not patient enough to do that and decided to stay where I was. In this area there are several lounges, which are actually spaces on the second floor near the boarding gates. These lounges have the advantage of giving direct boarding access but nothing else! As you can see, the lounge is nothing more than a space with tables and armchairs along the windows (the view is great, by the way). 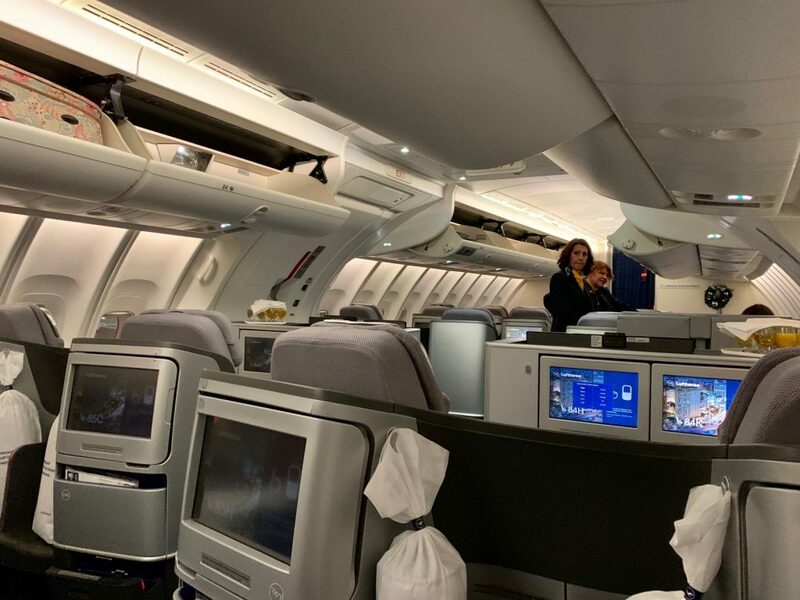 As the space was dedicated only to passengers bound for São Paulo, everything was very quiet when I arrived since it was very early in relation to the flight departure time. My opinion of the lounge? 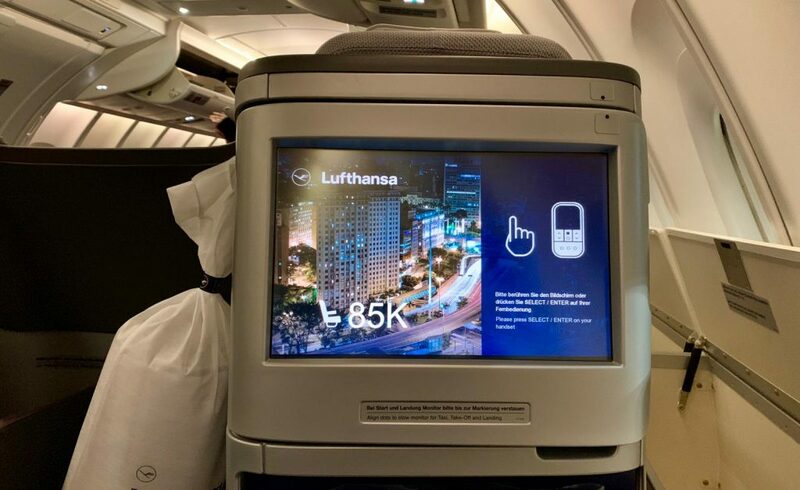 Nothing exceptional and considering it is the home airport hub of Lufthansa and the space is dedicated to its premium passengers, it could be a little better. Boarding started about 30 minutes before departure and everything went smoothly. As my seat was on the upper deck, I went up the stairs and there were three cabin crew working in the area. While one of them was in the galley, the other two circled the cabin, stowing coats and serving the welcome drinks. 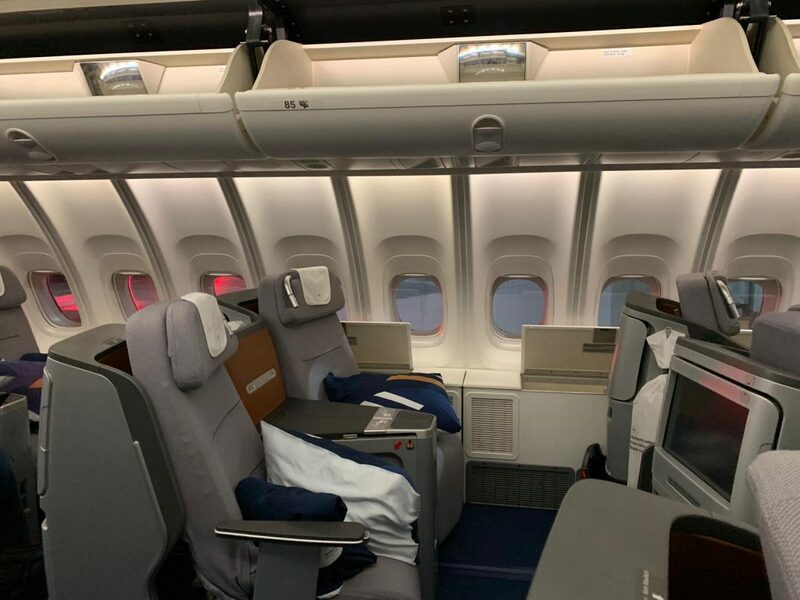 The business class configuration of the Lufthansa B747-800 is 2-2-2 on the main deck and 2-2 on the upper deck. I had a window seat, and as the flight was busy there was a passenger next to me. He was, by the way, one of the crankiest people I’ve seen aboard a flight! The crew actually asked me if my “friend” was OK!! 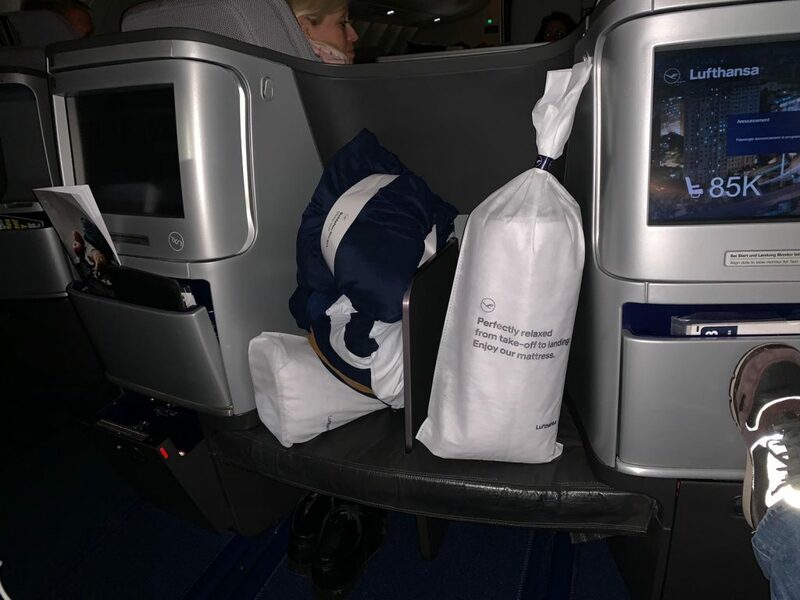 As soon as I arrived at my seat I found the amenity kit, blanket and pillow. A few minutes later the crew came to collect the coats and offer the welcome drinks and deliver the menu. I opted for the champagne which was ice cold and the serving was generous! The doors were closed at the scheduled time and a few minutes later we were already taking off. German punctuality 10/10! As I said above, I was on the upper deck where the layout is 2-2. The advantage of the upper deck is that you have an extra compartment to the side of the seat to store your personal belongings. However, particularly in the window seats, the area where you place your feet is tight when the seat is in the bed position. And I’m not that tall either! 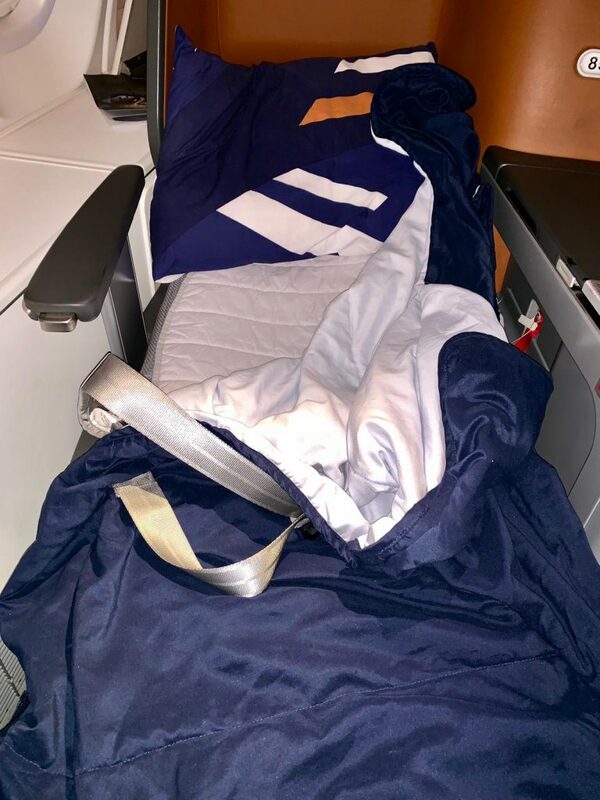 In addition to the usual quilt and pillow, Lufthansa also offers a mattress topper pad to put on the seat, making it a little softer. It’s been a while since I was travelling in a cabin with a 2-2 configuration and I’m going to confess that I really noticed the difference in terms of the lack of privacy and the inconvenience of having to “jump” over the passenger next to me every time I had to get up. If I were travelling with someone, I might not have noticed so much, but since I was alone and next to someone who was not very nice, it was a bit unpleasant. The amenity kit … ah … the amenity kit … My trip was before Christmas and Lufthansa were offering something rather Christmassy. The amenity kit was a little bag with a bell in the loop. And I have to say … what an annoying noise that little bell made! Leaving the jokes aside, the amenity kit was very basic and followed the standard of most European airlines. 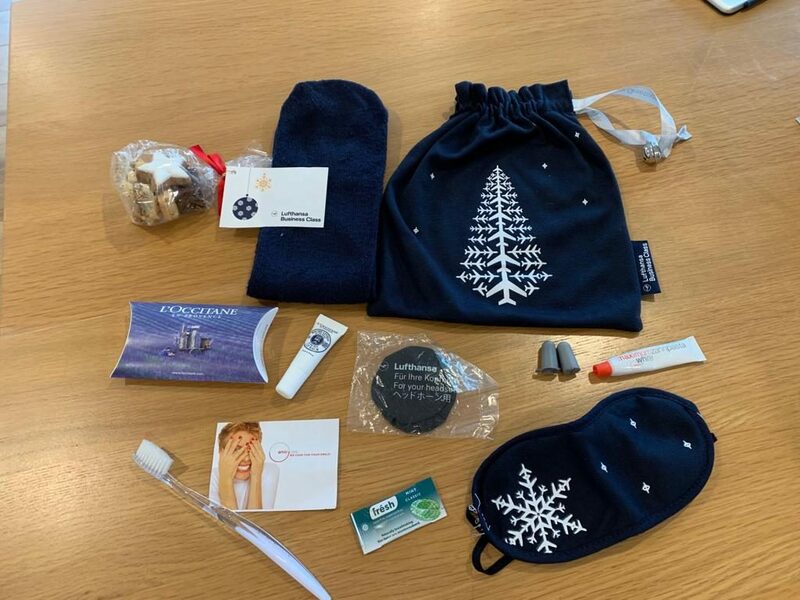 It came with the following products: socks, sleeping mask, L’Occitane lip balm, mints, earplugs, toothbrush and toothpaste, headphone covers and some Christmas biscuits. 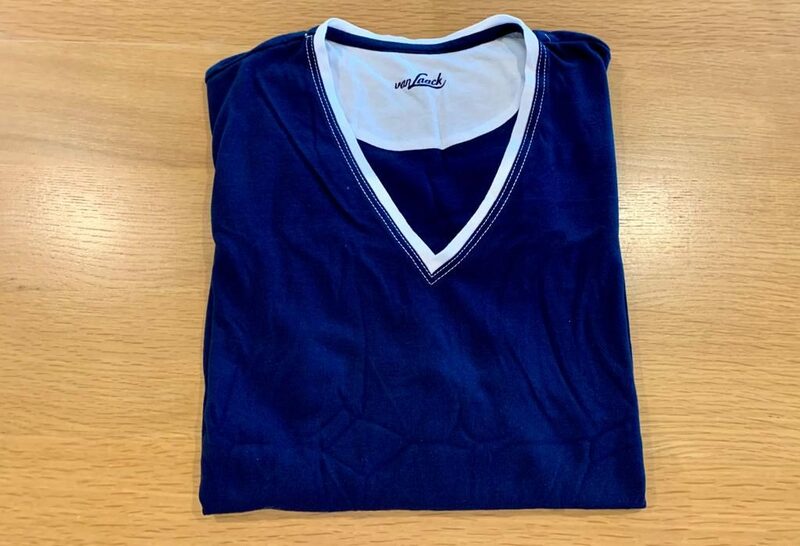 I was also given a long-sleeved T-shirt. Strangely there were no bottoms to make them into pyjamas! Here begins the high point of the flight. Incidentally, on-board service is Lufthansa’s strength. Always consistent and you know exactly what to expect. I would say that in all my flights with them, the crews have always been very friendly and, on that particular flight, it was no different. As soon as the seatbelt sign was off the crew began to work. They came with warm towels, then took food and drink orders and came with the first drink service. In terms of drinks, there was champagne, two white wines, two red wines, beer, soft drinks and a variety of hot drinks. 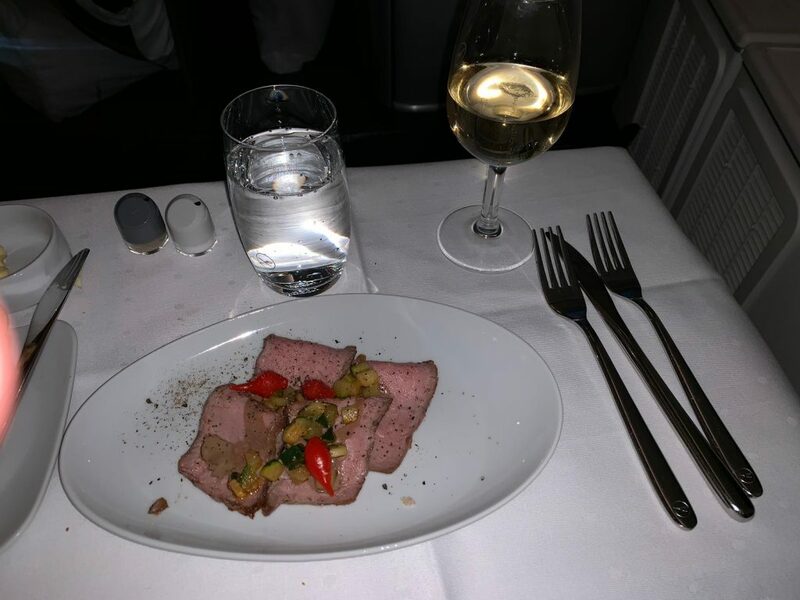 I was curious to compare what Lufthansa were spending on their business class wines. So I researched the prices of the champagne and wines and I was surprised. It is very rare to find drinks in business class at this price level. Of course, these are consumer prices and Lufthansa will get them at a much better price. 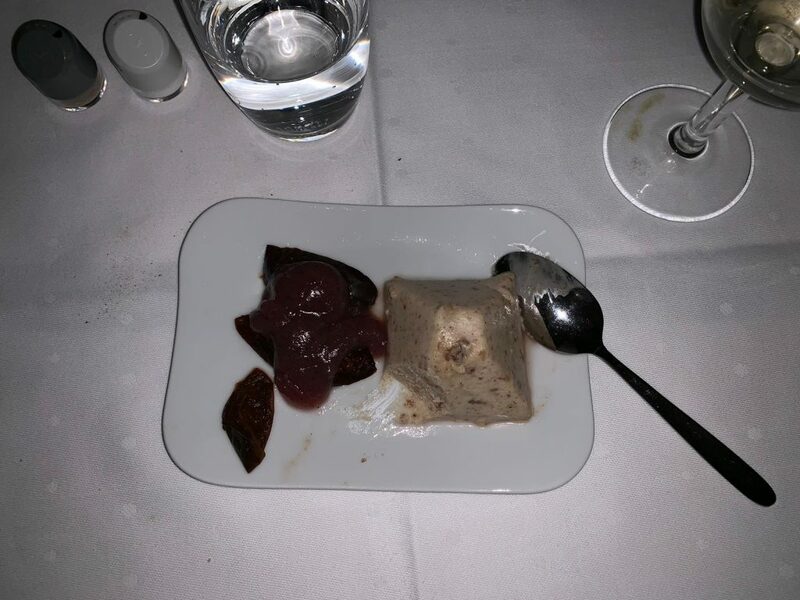 As for the meals there were three choices of starter, main course and dessert and also a salad of green leaves. The crew kept going through the cabin all the time and refilling glasses as soon as they realized they were empty. Needless to say, the dinner was excellent! The last stage of the on-board service was breakfast served an hour before we arrived in São Paulo. Again, the service by the crew was great. Lufthansa’s entertainment system is good and there is nothing to complain about really. It has a good range of movies, documentaries and music plus the screen size is good. 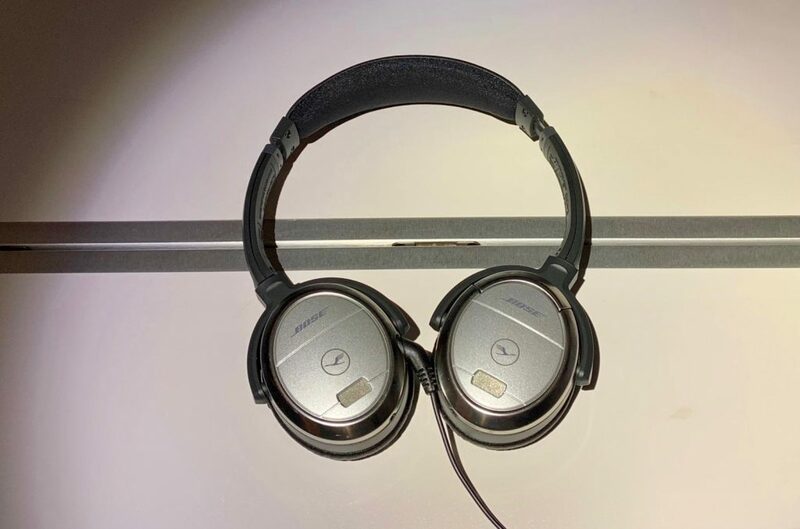 The headset was Bose branded and noise cancelling. They are stored in a compartment between the two seats and you have to put the covers on that come inside the amenity kit. The flight as a whole was very good with a super service from the crew. Dinner was delicious, with well-sized portions and a full glass all the time! Plus for me to fly on the B747 is always a joy! The only negative was the seat. With more and more companies offering the 1-2-1 layout, when you travel with an airline that still offers the 2-2-2 you feel the difference! I think in my case, it was a little worse because the passenger sitting next to me was not at all friendly. 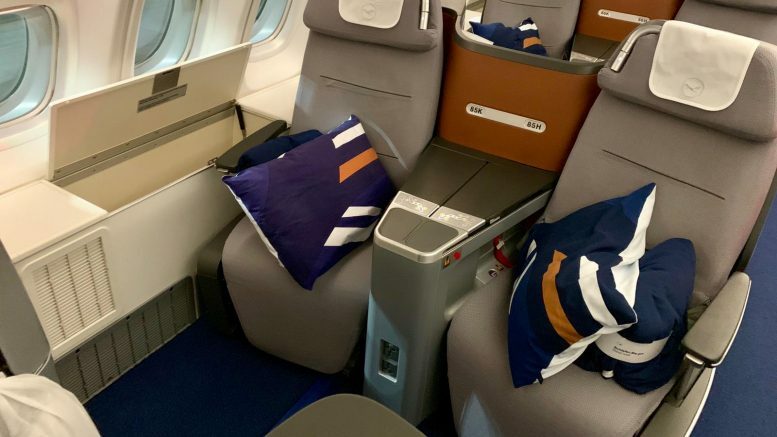 Be the first to comment on "Lufthansa B747-800 long haul business class review – how does it compare to BA?"